Yesterday while watching food channel in the topic of Rajasthan cusines "Chane Jaisalmer Ke" this recipe was prepared by one of the famous chef. I got hooked to this quick, easy and delicious dish and immediately I note down this dish and prepared it for dinner along with rotis,It turns out super delicious and my family loved it! 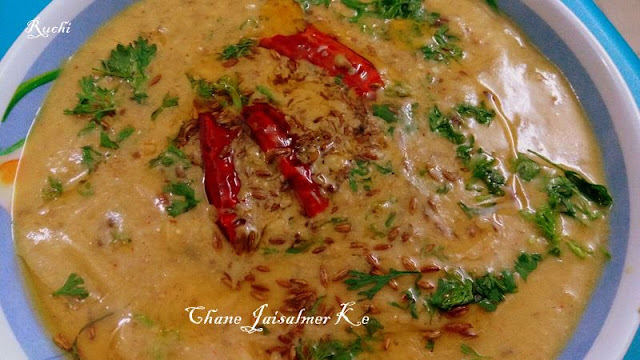 Chane Ke Jaisalmer also called "Chane Jaisalmer Ke", is a traditional dish made in Jaisalmer, Rajasthan. This dish is very easy to prepare and use with available ingredients, the curds and besan mixture. In this curry, the chick peas are cooked in a yogurt based gravy. The flavors of this gravy is mildly enhanced by the use of some fragrant spices.The yogurt and the besan two complement each other well in flavour and gives mild tanginess and also gives a velvety texture to the curry. 1.Soak kale chane over night and pressure cook them with 4cups of water and salt for about 30 minutes. 2. Once the steam dies down, open the cooker and mash half the chane roughly. 3.Heat oil in a wok. Add cumin seeds, cinnamon stick, bay leaves, 2 whole chillies. Once the jeera crackles, add grated ginger. 4.In a separate bowl mix yogurt, gram flour, turmeric powder, salt, red chilli powder, coriander powder, garam masala powder and whisk well so that no lumps form. 5.Add the yogurt mixture to the wok and stir constantly till it starts to boil. 6.Add the boiled chane, mashed chane and the water from chanas. Cook for a few minutes. Add water as required. Bring it to a boil and cook for five minutes. 7. Heat ghee in a pan. Add asafoetida, cumin seeds and whole chilli. When the seeds crackle, Pour in the yogurt mixture and stir well. 8.Garnish with coriander leaves and serve hot.